Industrial forced draft fans (FD Fans) operate by focusing the pressure and volume at the outlet of the fan to push air through a system. This focus creates positive air pressure. Applications calling for positive pressure requirements include boilers, glass furnaces, and ovens. 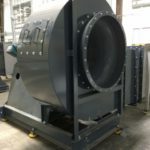 AirPro builds the industrial fans, blowers, and dampers necessary to maintain the highest-efficiency forced draft process air.